Ganesh or Vinayak Chaturty is one of the most popular festivals in India. 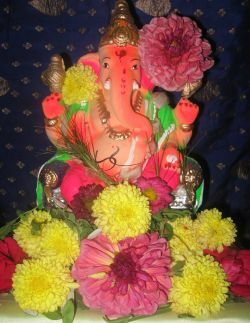 This festival is celebrated as the birth day of Lord Ganesh, son of Lord Shiva and Goddess Parvathi. Once, while Lord Shiva was away from Kailasa fighting the demons, Parvati created a boy with her divine powers and asked him to protect him the house and not to allow any one to enter into the house without her permission. One day while Parvati was taking bath, Lord Shiva returned from the war and while he was about to enter into the house, a young boy stopped him at the door and did not allow him into the house. Lord Shiva tried to convince the boy to let him into the house but all went in vain. The stubbornness of the boy made Lord Shiva very angry and he beheaded the boy with his trident and entered the house. Parvati grieved when she came to know that her son was killed by Lord Shiva. Lord Shiva soon realized that the boy was created by Parvati, to pacify Parvati, he ordered his army to go in the South direction and get the head of the first creature they see. Shiva's army headed in the South direction as per the Lord's command brought the head of a baby elephant. Lord Shiva placed it on the body of the boy and brought him to life, bestowed the powers of a God and blessed him that henceforth no activity will begin without invoking your name and blessings. The boy was then named the Adhipati (Deity) of the Lord Shiva's army (Gana), hence the name Ganapati or Ganesh. Gaj means elephant and anan means head, so Parvati's son is known as Gajanan. Even though Ganesh Chaturthy celebration starts on the fourth day of the Hindu calendar month of Bhaadrapada (between August 15th to September 20th), the preparation of the festivals starts 3-4 months in advance. Artists start creating the Lord Ganesh idols months in advance so that the demand can be met on the festival day. Traditionally the idols used to be made of clay and painted with natural colors, but to make the idols look more beautiful, people started creating the idols with Plaster of Paris and use synthetic paint. Generally a priest guides, an elderly person in the family performs the pooja. The place where the Ganesh idol is placed for the pooja is cleaned and nicely decorated. Pooja starts with the installation of a Ganesh idol (Pran Pratisthapana) followed by Shhodashopachara (16 ways of paying tribute). While performing the pooja, Vedic hymns from the Rig Veda, the Ganapati Atharva Shirsha Upanishad, and the Ganesha stotra from the Narada Purana are chanted. Depending upon the family tradition, the Pooja of Lord Ganesh's idol is done for 1, 3, 5, 7 or 11 days. Generally the community Ganesh pooja is done for 11 days. On the last day, Uttara pooja is done before immersing the Lord Ganesh's idol in to sea or river or a water well. Before 1893AD, Ganesh Chaturthy used to be a important festival in Maharashtra. The great freedom fighter and social reformer, Lokamanya Balgandadhar Tilak recognized the wide appeal of Lord Ganesh as every ones god and transformed the annual festival into a large, well-organized public event. The main purpose behind this was to bring unity among the people from different communities and to create the nationalist fervency among the people of Maharashtra against the British. Later this went on to become a major community celebrated festival in Maharashtra and other parts of India.